Type III High Early Cement | Salmon Bay Sand & Gravel Co. 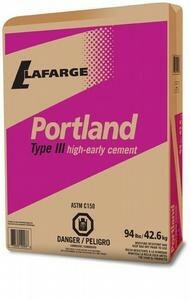 This cement provides higher earlier strength when compared with Type I-II. This is useful for maintaining a rapid pace of construction, since it allows cast-in-place concrete to bear loads sooner and it reduces the time that precast concrete elements must remain in their forms. These advantages are particularly important in cold weather, which significantly reduces the rate of hydration (and thus strength gain) of all Portland Cements. Salmon Bay sells Type III cement when requested in our ready mixed concrete and in 94 pound sacks through our sales office.